No need for a wide gait, or fear of slipping with these snowshoes! MSR has a category of snowshoes called Explore that are tailored for comfort like their Trail line while still borrowing some features of the alpinist Ascent line. We've been using the Revo Explore Snowshoes this Winter and they have become the go-to snowshoe for us for numerous quick trips out into the backcountry. The narrow ExoTract frame is made from steel with rugged teeth running along the perimeter. This is my favourite feature as I have never lost traction or felt unsafe while wearing them on icy ascents or declines. This is the second Winter in a row now where we've had more ice than snow, and rather than keeping your snowshoes waiting in the gear shed for a fresh dumping of snow, you can still head out and have fun with them. 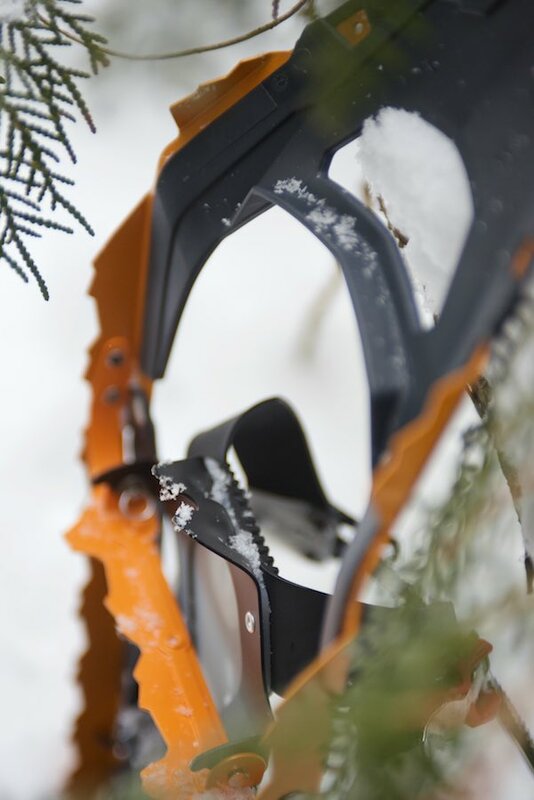 The rugged Injection-molded plastic deck keeps you afloat, and despite snowshoeing in frigid temperatures and punishing the decks through all types of rough terrain, they have held fast. My only qualm is that they can be kind of noisy when traversing on crusty snow. Built-in televators pop up by lifting up on them with your poles, and fold flat by pushing them back down. They never accidentally disengaged while ascending and provided a more natural stance to reduce fatigue when climbing steep or tricky hills. A welcome addition to this line of snowshoes is the HyperLink Binding which are two ratchet-style straps to keep your feet secure. One goes over the mid-point in your toe box, while the other goes over the back of your foot and pulls a cradle snug around your foot. Previous generations of MSR's straps had a tendency to flap around, even after tucking them away, but this method keeps everything in place. The straps are very quick to get your feet into or remove them after a long day's journey. It would be nice if the front strap was a smidgen longer as some Winter boots don't leave much length for the ratchet system to grab on to. The HyperLink Binding also makes the snowshoes a little higher, and while they still fit into my snowshoe bag, they might eat up a little more space in your knapsack. While out on the trails, it is as simple as pushing down on the red button to alleviate any pressure (even accessible while wearing gloves), or ratchet the strap a few clicks to make it a little more snug. Freezing rain/frozen snow/streams didn't interfere with with the HyperLink Binding other than you might need to scrape out under the release button if it ices up to disengage it. 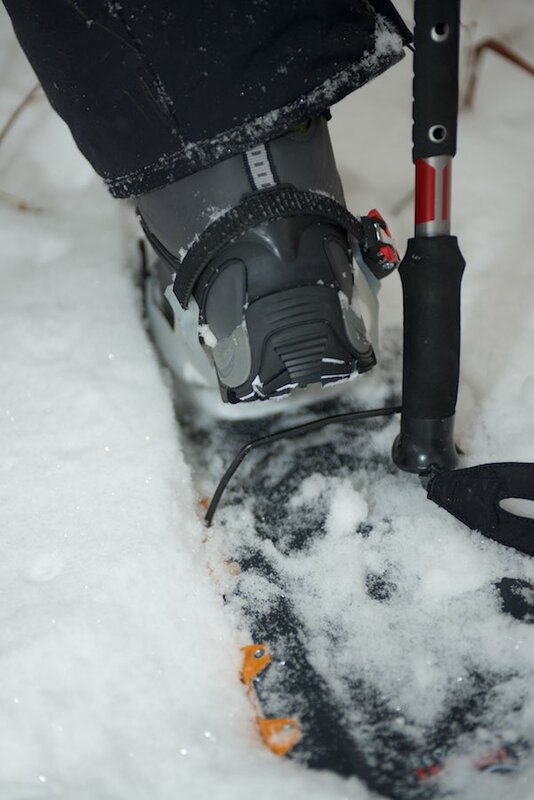 Once you set your heel strap, you can 'cheat' by only needing to engage your toe strap each time you enter/exit the snowshoe for even quicker engagement at the trailhead. Despite there only being two straps, I felt like it needed a third strap at first. During my first adventure out with them however that worry dissipated and found myself quite nimble with them. From climbing over fallen trees, to having to reverse my direction in hidden deadfall, the snowshoes were never cumbersome or unwieldy. 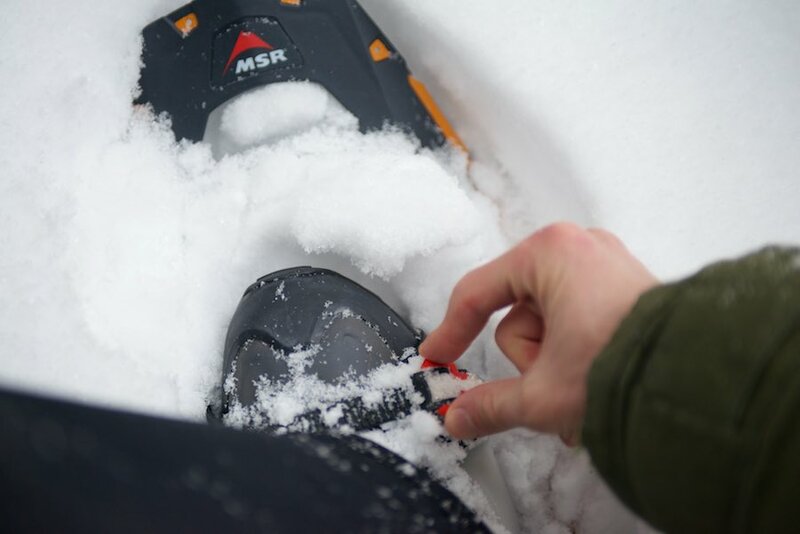 The MSR Revo Explore Snowshoes are perfect for your grab-and-go adventures whether you have fresh snow falling, or are getting cabin fever and need to go exploring in icy conditions. They are unisex and come in 22" and 25" sizes, and you can purchase add-on Modular Flotation tails if you have a large pack or are headed out in deep fluffy snow.